As a small guesthouse, our hope is to create a "home away from home" with true Lakeland bed and breakfast values to provide all our guests with high quality service and a comfortable, relaxing, enjoyable stay during their visit to the beautiful Lake District. Oakthwaite House is a Victorian town house built c.1876 in a quiet residential area of Keswick, only a five-minute walk from the town centre. Superbly situated to explore the stunning natural surrounds of the Lake District, or enjoy a romantic getaway and celebrate a special occasion, Oakthwaite House offers you a contemporary and extra special place to enjoy your visit to Keswick. 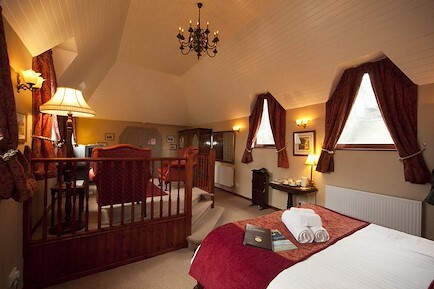 We also offer wireless broadband internet access in all rooms. The location of our guesthouse in Keswick and in the Lake District National Park makes it an ideal base from which to explore and enjoy the many wonders of the Northern Lakes. Parking is 'on street' and there are no restrictions. Unfortunately we do not take pets. We also have a "Stay & Save" special offer available for stays of 3 nights or more in the New Year, just book direct with us and quote "Stay and Save Winter". View our Tariff Page for more information. We offer a range of delicious hearty breakfast options to give you the perfect start to any morning. On request, we also offer packed lunches, please contact us to discuss your bespoke catering requirements. The very best of wishes. From the M6 motorway take the A66 heading west towards Keswick. After about 16 miles from the motorway, take the first exit into Keswick and head for the town centre. You will soon pass a BP garage on your left, after which you will go under a railway bridge. Take the fourth turning on the left after the railway bridge, at the Conservative Club. This is Greta Street. Helvellyn Street is the second street running across Greta street. Turn left onto Helvellyn Street; Oakthwaite House is the third house on the left from the junction of Greta Street and Helvellyn Street. GPS works too using our postcode – see our address below. Penrith, the gateway to the northern Lake District and Keswick, is on a regular and fast train service between London and Glasgow/Edinburgh. Once at Penrith, catch a bus, the X4/X5 to Keswick. View this timetable in the next section. Alternatively, if you are flying into Manchester, there is a regular train service between Manchester airport and Windermere. From there catch the 554/555/556 to Keswick. There is a wide range of bus services to and from Keswick from a number of destinations, in and out of the Lake District. The X4/X5 service that runs between Penrith and Workington is the one to use if travelling up by train. Your enquiry will be sent directly to Oakthwaite House. Please fill in as much detail as you can.